With its relaxed atmosphere, eye-pleasing landscapes, and fun activities, the Cayman Islands are the kind of destination that aims to please everyone. Sun-worshippers will love discovering the numerous beaches that compose the stunning coastline of the Sister Islands, where thrill-seekers will find their adrenalin fix, through a variety of water-based activities above the colourful marine landscape, or even up in the air for birds’ views of the country. 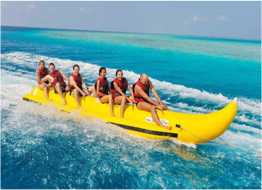 Snorkelers and divers will also be excited by the various sites and attractions found around the islands, and ranging from a family-friendly sting ray park to dramatic wall dives. 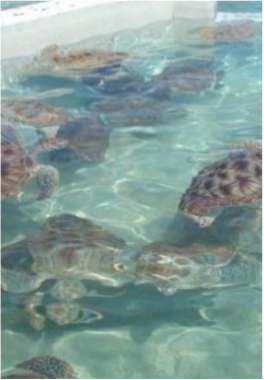 Back on the land, wildlife enthusiasts will enjoy the many trails winding through the country’s stunning reserves and parks that are home to a bountiful variety of fauna and flora, whilst the Turtle Farm is the opportunity to approach and learn about the animal’s role in the Cayman Islands’ history. Located in Savannah, in Grand Cayman, this edifice is a historically accurate restoration of an original 1780 great house that took no less than seven years to complete, and is the most extensive restoration project ever undertaken by the country. Exploring the island via the many footpaths and trails is the best way to spot and observe some of its magnificent wildlife, such as the national tree, the silver thatch palm, mangrove forests, wild banana orchids, the Cayman parrot, as well as the Western Hemisphere’s largest colony of red-footed boobies. 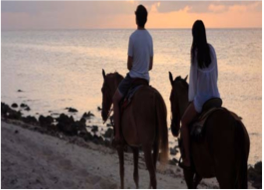 A fun alternative to your usual hike may be to explore the land and coastline on horseback, with the option of taking a swim with the horse, or even to organise a romantic sunset beach ride. On Cayman Brac, get a chance to spot the rare and endangered Brac Parrot at the island’s 180-acre parrot reserve. Whilst Little Cayman’s Booby Pond Reserve is home to the Western Hemisphere’s largest red-footed boobies. 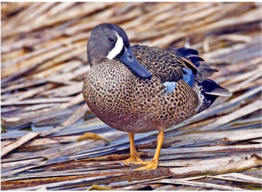 The two islands are also visited by over 70 species of non-breeding wetland migrants, including egrets, ducks, plovers, sandpipers, even flamingos and spoonbills. Located on Little Cayman, this beautiful Marine Park is home to the world renowned Bloody Bay Wall, a diving site featuring a spectacular drop from 20 feet to 6000 feet, and that is home to colourful coral gardens, tropical fish, and sea plumes. Divers will enjoy many more forms of marine life species thriving in the bountiful surroundings of this healthy park and its numerous diving sites. Make the most of the Cayman Islands’ great Trade Winds by taking a lesson or renting a kite surf through the various operators located on each island, such as Kite Cayman, Lostboys Kitesurfing, or The Kite House. A fun way to enjoy the waters with your friends and loved ones, where the driver tends to make the boat flip by taking unexpected turns. If you’ve seen all there is to offer under the water, or perhaps prefer to keep dry- Fat Fish Adventures offer reef fishing, offshore trolling, night fishing or lobstering. An unusual and memorable experience is hopping on a jet ski, snorkelling for lobster holes and fishing for your own dinner expertly cooked and served up with all the trimmings on your return to shore in the Fat Fish restaurant! The National Museum in George Town mixes both a natural and cultural history, and is one of the more educational of Grand Cayman's attractions. The natural history side documents native Caymanian flora and fauna, whilst the cultural history side documents the lush heritage of the Caymanian people. This 23 acres marine park aims to convey the country’s passion for turtles, documenting their role in the Cayman Islands’ history, as well as the efforts made to protect them. This fun and safe environment offers interactive activities involving not the only the islands’ turtles, but plenty other flora and fauna, including the opportunity to swim and snorkel with fish and other marine life in the farm’s very own 1.3 million gallon salt-water lagoon. With a strong sense for wildlife conservation, the Cayman Islands are a great place to observe a variety of flora and fauna in their natural habitat, and birds are no exception, with over 200 species to spot on your hiking exploration, or at one of the country’s reserves and sanctuaries. Located off Cayman Brac’s northwest coast, this 330 feet-long Russian-built Cuban naval frigate was sunk in September 1996 and is now home to an abundant variety of marine life. A fun alternative to snorkelling, rent a kayak and paddle around the islands’ colourful sea life, paddle further to explore Owen Island, or try one of the stunning bioluminescent tours in North Sound! With the country’s maritime traditions and heritage so deeply anchored in the maritime activities, it’s only logical to be adding a boat trip on your things to do. Whether it’s a fishing, snorkelling trip or a bit of romantic sunset cruising, you will find many operators to help you organise your perfect exploration of the Caymanian waters. Swimming with a school of sting rays may sound pretty dangerous, but in actual fact these amazing sea creatures are pretty docile. In the 80’s, fisherman would anchor at North Sound and clean their catch. The sting rays soon figured out that it was a great place to get their dinner- and Sting Ray City was born. Today, instead of the fishermen bringing lunch it’s the tourists, who flock here to see around 30 or 40 Stingray. The waters here aren’t deep, so young visitors can also enjoy the experience and you’ll get great views. Located on the North end of Grand Cayman Island, this park was inaugurated on the 27th February 1994 by Her Majesty Queen Elizabeth II herself, and offers an experience encompassing both nature and heritage. Add a touch of adventure to your discovery of the Cayman Islands by taking a tour to explore the underground networks of caves that sleep under the islands. 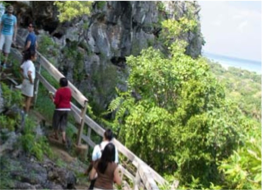 You will find the country’s best cave sites on Cayman Brac, including Peter’s Cave, the Great Cave, the Bats Cave, Rebecca’s Cave. Grand Cayman alone counts seven bird sanctuaries, including the Queen Elisabeth II Botanic Park, the Salina Reserve, Majestic Reserve, and the Colliers Pond, which are home to the likes of Tricoloured Herons, Common Moorhen, Green Herons, Black-necked Stilts, American Coots, Blue-winged Teal, Cattle Egrets and rare West Indian Whistling Ducks. This Chanticleer Class Submarine Rescue Ship is the country’s latest wreck dive addition, after being in service from 1945 to 1994, with one of her most honourable trip being the recovery of the Challenger Space Shuttle Disaster. The ship reached the Cayman Islands after a dangerous 9 days-trip through an ice storm, and on January 5th, 2011 a three cannon salute signalled the Kittiwake’s triumphant sinking off the shores of Grand Cayman. 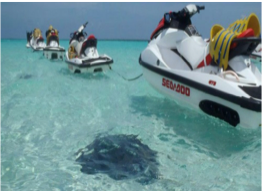 If you’d like to add a touch of speed and adventure to your marine exploration, rent a jet-ski from one of the operators found on popular spots such as Seven Mile Beach and Rum Point. Also known as SUP’ing, you will mostly find this fun yet challenging activity on Grand Cayman Island. An exciting water-based activity that enables you to view the islands from a bird’s point of view, with an added dose of adrenaline. Grab you waterproof action camera and record what you’ll find out to be some of the best views of the country. Regularly topping the listings of the world’s best beaches, the deceptively named, and hugely well-known Seven Mile Beach – which is actually 5 ½ miles long- is just one of the many reasons people consider Cayman to be the ultimate Caribbean destination. Attracting visitors from all over the world, this Beach features clear waters and coral sands, and is home to many luxury resorts. If you’re not keen on scuba diving but would like to explore the submarine world of the Cayman Islands, the Atlantis Submarine is accessible to everyone and offers the opportunity to get closer to coral canyons, ship wrecks and healthy reefs, all housing a colourful variety of marine life that you will be able to observe from the comfort of your seat, whilst staying dry and immune to any pressure effects. Maybe not the first thing that springs to mind when you imagine your Caribbean holiday, but at 62,000 square feet, Black Pearl Skatepark is the second largest in the world! Keen skaters can take on the entire park or choose individual sections like the roundwalls, a deathbox, pockets, stairs, verts, thumbs to name a few. For those wishing to take their holiday relaxation to another level, the country has a selection of world-class spas and yoga centres to help you completely rejuvenate during your stay. And with many resorts offering their own onsite wellness facilities nowadays, the deep relaxation you’re hoping for could be right on your accommodation’s door-step! A 9-hole championship course or an 18-hole short course designed by Jack Nicklaus, with a layout offering the chance to shoot over the North Sound on the 5th hole. Onsite facilities include pro-shop, lessons, bar and restaurant, as well as material rental. Spread over 500 acres along the famous Seven Mile Beach and stretching up to the North Sound, Camana Bay is composed of four pedestrian-friendly villages with beautiful walkways and cycle paths leading to sleek parks, gardens, and elegant architecture. There you will find some of the country’s most renowned eateries, as well as a vast selection of boutiques to spend a perfectly relaxing and indulging day. Located right off the North Sound, this Club features the country’s only 18-hole Championship course and is easily accessible from Seven Mile Beach. Onsite facilities include a pro-shop, driving range, and an outdoor bar, and the likes of iguanas, birds and small lizards may join you during the game. 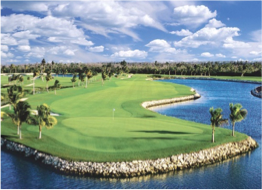 Located at the Ritz-Carlton on Grand Cayman this challenging 9-hole course designed by Greg Norman features 8 holes on the water, and is open to guests and residents of the prestigious hotel. Onsite facilities include club rentals and lessons.